The American Civil Liberties Union of Alaska on Thursday filed a lawsuit against the state of Alaska over a recent crackdown on political campaign signs. An independent expenditure group supporting Republican gubernatorial candidate Mike Dunleavy and an individual, Alaska resident Eric Siebels, are also plaintiffs in the case. The ACLU is seeking to block the enforcement of a state statute that bars signs near state roadways, and wants those rules to be struck down as unconstitutional, the group said in a statement. The case lists both the state of Alaska and the Alaska Department of Transportation and Public Facilities as defendants. 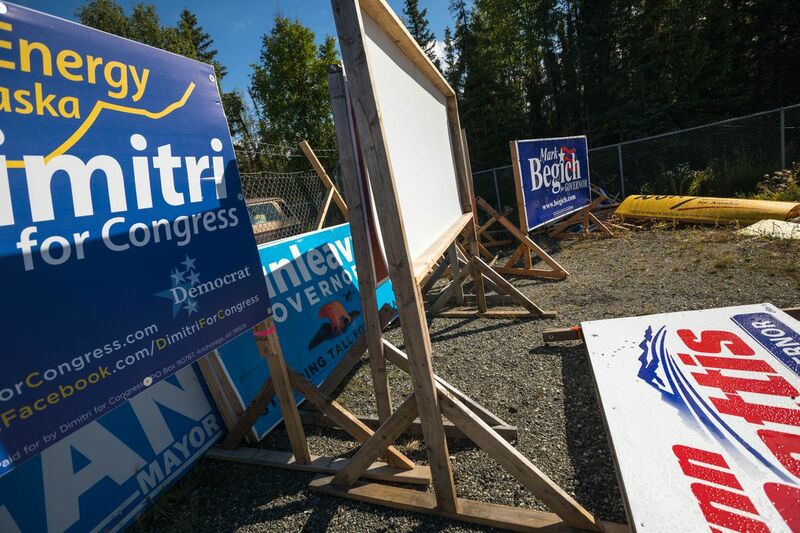 The lawsuit comes after the DOT seized more than two dozen political campaign signs in Anchorage, as the Daily News reported earlier this month. Those signs were illegally placed along state roads, officials said. The state statute the ACLU cited in its lawsuit says "outdoor advertising may not be erected or maintained within 660 feet of the nearest edge of the right-of-way and visible from the main-traveled way of the interstate, primary, or secondary highways" in Alaska. Laws about those signs "have been little enforced in recent years" because of budget cuts, the Daily News reported in early August. This summer, the DOT put tags on 200 to 250 signs across Anchorage that the agency said needed to be removed, and many campaigns did move them, the newspaper previously reported. At the end of July, DOT removed 30 signs that were said to be safety hazards. The DOT "flagged and confiscated several Dunleavy for Alaska signs," the lawsuit says. The ACLU argues that the crackdown has targeted political speech specifically. "We, along with our supporters who are absolutely outraged by this, we just want to ensure that everyone has their right to free speech protected," said Terre Gales, chair of the independent expenditure group in the case, Dunleavy for Alaska. "And that's regardless of who they support." Dunleavy's campaign manager, Brett Huber, earlier this month questioned whether DOT's enforcement was fair to all candidates, according to the previous Daily News story. Gov. Bill Walker's brother, Bob Walker, who handles signs for the governor's re-election campaign, told the newspaper he picked up Walker signs that he saw had been flagged by DOT. As of Thursday afternoon, the state had not been served with the lawsuit, said Cori Mills, assistant attorney general for the Alaska Department of Law. "The state will review the claims made in the complaint and evaluate what response would be appropriate," Mills said in an email. Asked for a comment on the lawsuit, DOT spokeswoman Meadow Bailey said in an email that the agency recognizes that advertising is an important effort and expensive investment. "Each year we reach out to campaigns to remind them of Alaska's laws," she said. "Entities are given notice before signs are removed, unless the sign is a safety hazard and in these instances the sign is removed as quickly as possible." Dunleavy for Alaska raised $760,000 in support of the candidate during the primary election. Dunleavy, a former state senator, won the Republican primary for governor earlier this week. Independent expenditure groups can raise unlimited donations from individuals and corporations, but they can't coordinate with campaigns.